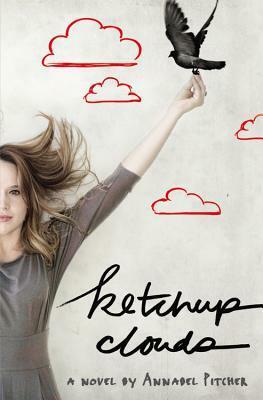 Ketchup Clouds by Annabel Pitcher. Little Brown and Company, 2012. 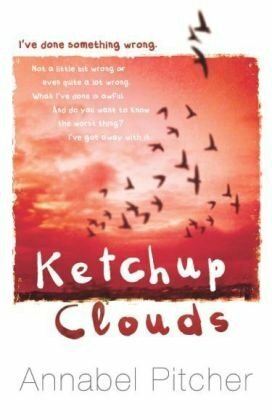 Face Value: Well I like the ketchup clouds. But other than that I don’t really understand the cover, and don’t like it all that much. I much prefer this alternate cover (I think it’s the British version, or maybe the paperback? hard to tell from Goodreads), which draws you in right away, plot and character-wise. Does it Break the Slate? Getting there. I felt a deep empathy for Zoe, our protagonist, and I totally believed that she was on her way to becoming a Slatebreaker. This girl has so much weighing her down, and I sure don’t know if I could have handled all of that on my shoulders, especially as a teenager. Even though it’s really not until the end of the book that she starts to pull herself together and take her life, and happiness, into her own hands, I really believe that Slatebreaking is in her future. Who would we give it to? Mystery readers will be intrigued by the “what really happened” element, and contemporary realism fans will appreciate the authenticity of Zoe’s voice, her boy troubles, and her expertly written family dynamic. If you read this book, like I did, because you loved Annabel Pitcher’s first book, My Sister Lives on the Mantelpiece, you won’t be disappointed. No arguing, that’s a really compelling first paragraph. It’s with those words we’re introduced to Zoe (not her real name) who lives at Fiction Road (not her real address). She doesn’t know who to talk to, so she starts writing a letter to Mr. Stuart Harris, a convicted murderer on death row in Texas. She tells him about her parents, whose marriage is rocky, her sisters, who have their own struggles, and the two boys she fell for, which ended on one of them dying. It was Zoe’s fault. Nobody knows that. She got away with it. And it’s eating away at her. So she writes to Mr. Harris, because he thinks he, at least, has to understand what it feels like. Annabel Pitcher is a terrific writer and Zoe’s anguish comes through poignantly as the story unfolds. At times it’s hard to read, almost, because it’s so hard to be in Zoe’s mind, dealing with her guilt and fear and grief. But we also see a bigger picture, the story that is unfolding around Zoe, so much of which she has no control over. It’s heartbreaking, but it’s also excellent writing. The mystery is drawn out just enough that we’re curious and a little nervous about getting to what really happened. But it’s not overwrought or overly clouded either. What happened with the boys – the resolution is satisfying and emotionally resonant. But I actually found myself even more impacted by her family dynamic. Pitcher does a great job of crafting this family full of flawed people, who love each other, but struggle to do, say, and be the right thing to each other most of the time. There’s a scene between Zoe and her mother, towards the end of the book, that basically wrecked me. Clearly, Annabel Pitcher is a writer to watch out for. And probably not a writer to read in public, based on my first two reading experiences of her books. This entry was posted in Reviews, Young Adult and tagged British Writers, Contemporary Realism, Family, love, Murder, Mystery. Bookmark the permalink. I’ve wanted to read this for a while, but haven’t heard many reviews of it! That first paragraph *really* pulls you in!! A bit disappointed to hear it wasn’t a Slatebreaking novel, but it sometimes is nice to see a character on the start of her journey. Great review as always! Ugh, I find the title and cover off-putting, but I do like books that feature interesting family dynamics. Thanks for highlighting it.